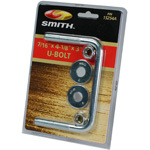 Navigate: StoreFront / Trailer Parts / Bunk, Bolster, Keel Brackets & Assemblies / Bolster Brackets / Swivel Bracket Assembly - 11"
Swivel Bracket Assembly - 11"
This Smith adjustable bracket is designed to support roller bunks. Hot dip galvanizing for years of use in the harsh marine environment. 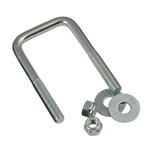 This bracket assembly uses bolster bracket-10101G and swivel bracket-10200G. 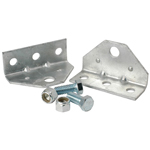 Bolster bracket: 10" bracket, 11 gauge material, 2-1/2" wide, slots 1/2" wide, swivel hole 1/2" dia., slots 3-3/4"
Swivel bracket: 11 gauge material, bunk flange 1-3/8" x 3-1/2", bunk flange holes 3/8" dia., swivel flange 2" tall x 3-1/2", swivel flange hole 1/2" dia., hole centers 2-1/2"
Overall assembly length is 11"
Zinc U-Bolt 7/16"-14 X 3-1/8" X 3"
Zinc U-Bolt 7/16"-14 X 3-1/8" X 4"
Zinc U-Bolt 7/16"-14 X 4-1/8" X 3"